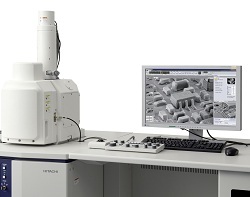 SEEN in Europe for the first time at EMC2012 in Manchester, the Hitachi SU3500 variable pressure scanning electron microscope (VP-SEM) will deliver levels of performance previously unseen in this class of instrument, says the company. Featuring a newly designed Ultra Variable Pressure Detector (UVD) and a new low-aberration objective lens, the imaging performance is described by Hitachi High-Technologies as incredible, especially at low voltages. The new electron gun and image processing system are said to provide the highest signal-to-noise ratio for exceptional imaging clarity, as well as improving navigation and making image adjustment easier.The new detector delivers efficient topographical SE imaging across the voltage and pressure ranges, while the high sensitivity five-segment BSE detector provides ‘impressive’ compositional imaging. Real-time 3D observation is provided by a live stereoscopic function, giving a true impression of sample morphology. An optional auto-stereoscopic 3D display which obviates the need to wear special 3D glasses for this. The new user interface provides intuitive operation experience, says Hitachi, while fast and accurate auto-functions, including a comprehensive auto-start feature, ensure quick and reliable imaging on any sample and by any user.